Our roastery is located in the heart of the village of Maclean in Northern NSW overlooking the majestic Clarence River. We’re housed in a beautiful historic building that began life as Sheehan’s mechanical workshop in the 1940s, and has evolved through the years as businesses came and went. The building was in danger of being condemned before we acquired it in 2010. After extensive repairs and renovations we have ensured this building honours its past and will remain in our local community for many more years. Look through the floor-to-ceiling glass walls between our café and roaster and you may notice the original engine hoist still hanging proudly from the rafters or perhaps signs of the original grease that is now varnished into the original hardwood floors. Just like it did back in the 1940s our building is once again providing careers and industry to an amazing community. 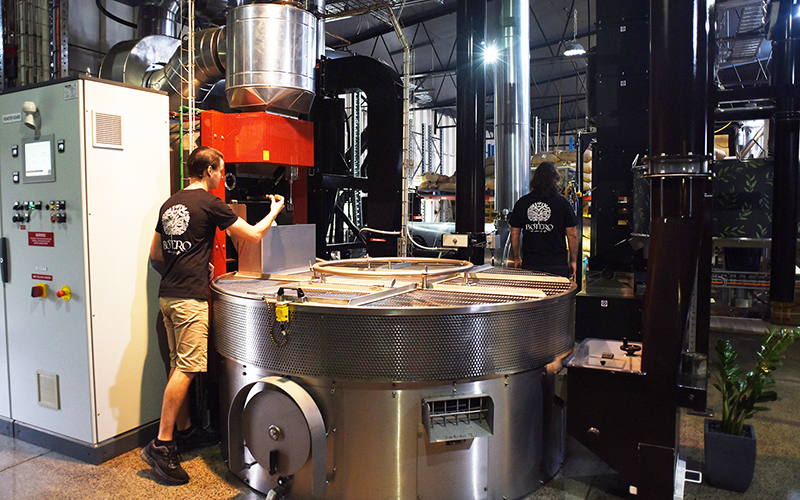 We use industry leading, world class roasting and packaging machinery to produce what we feel are some of the finest blends of coffees available anywhere in the world. Our primary roaster was custom made specifically for us by Brambati in Italy and enables us to provide our customers with consistent coffee blends and single origin offerings all year round. Our café partners can choose from our five signature blends or we can develop custom blends to ensure our café partners are setting the benchmark in their region. Throughout the year we offer various one origin coffees that showcase a particular region, variety of coffee, or even a particular grower. Our One Origin offerings are selected after much research and are carefully roasted on our Probat small batch roaster. We invite all of our café partners and their teams to come and spend as much time as they can spare with our roast team to experience the process from green bean to cup. Our roast team are passionate operators who will share as much knowledge as humanly possible to ensure complete trust in Botero as your roast partner.